The nonlinear response of a composite medium to an external electric field can be greatly enhanced if the system is near a strong isolated quasistatic resonance. This situation, achievable in metal-dielectric composites, can result in bistability of the bulk effective dielectric response. Close enough to the resonance, the bistability can occur in field intensities so low that the local nonlinear behavior is weak everywhere inside the composite medium. This allows for the development of calculational methods for the nonlinear behavior based on a “zero virtual work” variational principal and a selection of trial fields of the form suggested by a corresponding linear system. 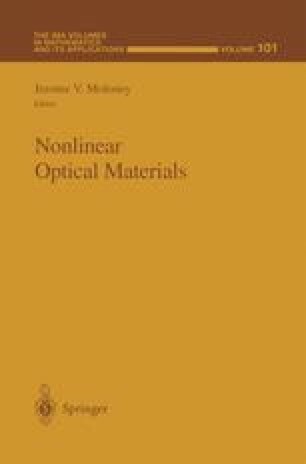 In composites where the nonlinear component has a second harmonic generation capability, the enhancement can lead to induced third order nonlinearity, as well as bistability, at the fundamental frequency. The enhancement in this case can be achieved near a quasistatic resonance at either the fundamental or the harmonic frequencies.